I recently made this potato salad for 15 people. I will I never do it again unless I lose my mind and become a caterer.Nor would I recommend that you undertake such a preposterous task. But I would recommend that you try this recipe in smaller proportions. It’s my family’s new favorite. 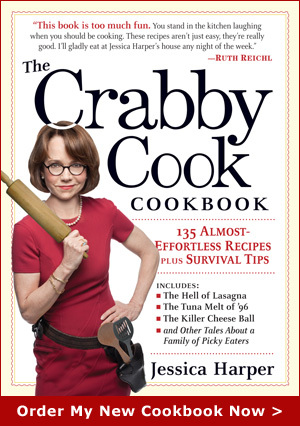 The old Crabby recipe is good too, but I’m thinking this one trumps it. 1. Trim the beans and drop them in a large pot of boiling salted water for two minutes, just until tender-crisp. Drain, run under cold water to cool, and set aside to dry on paper towels. 2. Bring another large pot of water to boil, add the potatoes and simmer until tender, but still a little bit firm, about 25 minutes. Drain the potatoes and set them aside to cool, covered with a dish towel. Combine the vinegar with the garlic, mustard, salt and pepper. Slowly whisk in the olive oil until the dressing is smooth and emulsified. Set aside. 4. When the potatoes are cool enough to handle, peel them (or not) and cut them into slices roughly ¼ inch thick. Place the slices in a salad bowl. Add the beans and the herbs. 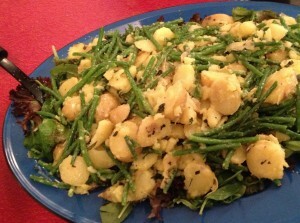 Pour the dressing over the salad and toss gently with your hands to coat all the ingredients and distribute the herbs. This entry was posted on Sunday, August 25th, 2013 at 2:29 pm	and is filed under Salad Days. You can follow any responses to this entry through the RSS 2.0 feed. You can leave a response, or trackback from your own site.